Smith Industrial Service is capable of clearing any line ranging from 1-120 inches in diameter. SIS specializes in large diameter line cleaning in addition to troubleshooting difficult line cleaning projects. We take pride in our fleet of Vactor combo trucks, the industry’s leading sewer and drainage cleaning equipment manufacturer. SIS can provide you with a cleaning of your wastewater collection system so that it will function properly and reduce the number of stoppages, odor complaints, lift station failures, and return the intended flow to the system. We can also help you minimize the maintenance required in line cleaning. 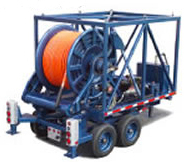 In addition to high-velocity sewer jetting, we have a variety of line-cleaning techniques, and equipment for all sewer and drain lines.